All transactions are safe and secure with a reliable history in online purchasing behind each of our associates. Buy the Kenneth-the-Page Costume t-shirt to own 30 Rock clothing and merchandise. Kenneth Parcell (Jack McBrayer) is the principal page on the 30 Rock TV show. No one really understands why Kenneth is so happy to do his menial job. In two different episodes ("Pilot" and "The Head and the Hair") Kenneth explains that his enthusiasm comes from the fact that he loves television so much. 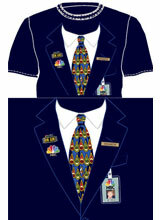 These Kenneth-the-Page 30 Rock costume t-shirts display a design that includes Kenneth's name tag, his id badge, his necktie, and the NBC logo. Wear this tee as you imitate Kenneth's distinctly Southern accent, happy attitude and unusual personality. In addition to the Kenneth-the-Page Costume tee above, browse the 30 Rock Clothing Gallery for more apparel like men's and women's clothes, kids shirts or hoodies.